Instant downloads of all 946 LitChart PDFs (including The Chosen). 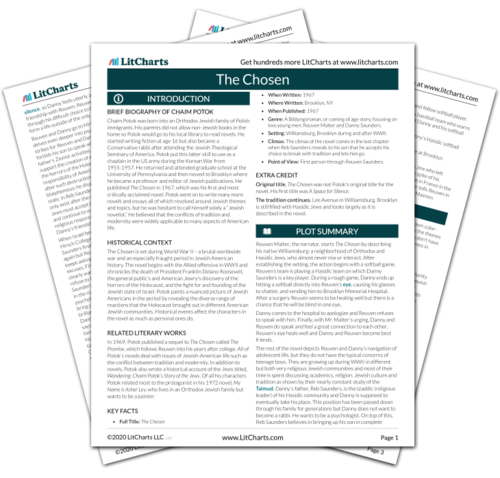 Welcome to the LitCharts study guide on Chaim Potok's The Chosen. Created by the original team behind SparkNotes, LitCharts are the world's best literature guides. A concise biography of Chaim Potok plus historical and literary context for The Chosen. A quick-reference summary: The Chosen on a single page. In-depth summary and analysis of every chapter of The Chosen. Visual theme-tracking, too. Explanations, analysis, and visualizations of The Chosen's themes. The Chosen's important quotes, sortable by theme, character, or chapter. Description, analysis, and timelines for The Chosen's characters. Explanations of The Chosen's symbols, and tracking of where they appear. An interactive data visualization of The Chosen's plot and themes. Chaim Potok was born into an Orthodox Jewish family of Polish immigrants. His parents did not allow non-Jewish books in the home so Potok would go to his local library to read novels. He started writing fiction at age 16 but also became a Conservative rabbi after attending the Jewish Theological Seminary of America. Potok put this latter skill to use as a chaplain in the US army during the Korean War from 1955-1957. He returned and attended graduate school at the University of Pennsylvania and then moved to Brooklyn where he became a professor and editor of Jewish publications. He published The Chosen in 1967, which was his first and most critically acclaimed novel. Potok went on to write many more novels and essays all of which revolved around Jewish themes and topics, but he was hesitant to call himself solely a “Jewish novelist.” He believed that the conflicts of tradition and modernity were widely applicable to many aspects of American life. 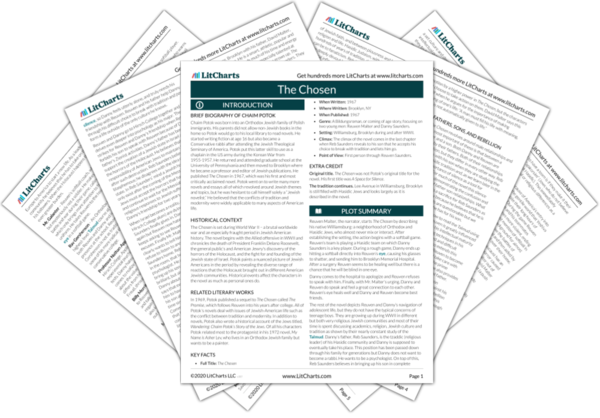 Get the entire The Chosen LitChart as a printable PDF. The Chosen is set during World War II – a brutal worldwide war and an especially fraught period in Jewish American history. The novel begins with the Allied offensive in WWII and chronicles the death of President Franklin Delano Roosevelt, the general public’s and American Jewry's discovery of the horrors of the Holocaust, and the fight for and founding of the Jewish state of Israel. Potok paints a nuanced picture of Jewish Americans in the period by revealing the diverse range of reactions that the Holocaust brought out in different American Jewish communities. Historical events affect the characters in the novel as much as personal ones do. In 1969, Potok published a sequel to The Chosen called The Promise, which follows Reuven into his years after college. All of Potok’s novels deal with issues of Jewish-American life such as the conflict between tradition and modernity. In addition to novels, Potok also wrote a historical account of the Jews titled, Wandering: Chaim Potok’s Story of the Jews. Of all his characters Potok related most to the protagonist in his 1972 novel, My Name is Asher Lev, who lives in an Orthodox Jewish family but wants to be a painter. Genre: A Bildungsroman, or coming of age story, focusing on two young men: Reuven Malter and Danny Saunders. Setting: Williamsburg, Brooklyn during and after WWII. Climax: The climax of the novel comes in the last chapter when Reb Saunders reveals to his son that he accepts his choice to break with tradition and lets him go. Point of View: First person through Reuven Saunders. Original title. The Chosen was not Potok's original title for the novel. His first title was A Space for Silence. The tradition continues. Lee Avenue in Williamsburg, Brooklyn is still filled with Hasidic Jews and looks largely as it is described in the novel. Hameline, Amanda. "The Chosen." LitCharts. LitCharts LLC, 16 Sep 2013. Web. 6 Mar 2019. Hameline, Amanda. "The Chosen." LitCharts LLC, September 16, 2013. Retrieved March 6, 2019. https://www.litcharts.com/lit/the-chosen.